Nick and Wendy talk about the tradition of Christmas markets in Europe. 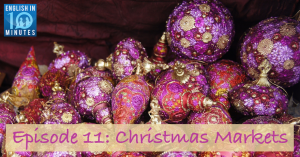 They discuss several Christmas markets that they have visited, their experiences at the markets, and why they like them. The episode comes with a worksheet containing a transcript of the conversation, analysis of the best vocabulary, and discussion questions to help you make the most of the conversation.